Fleet Cleaner performed the hull cleaning of the largest vessel in the world, the Pioneering Spirit. Despite the stormy weather, cold temperatures and wind force 7 Bft, Fleet Cleaner was able to clean this vessel during its port call. 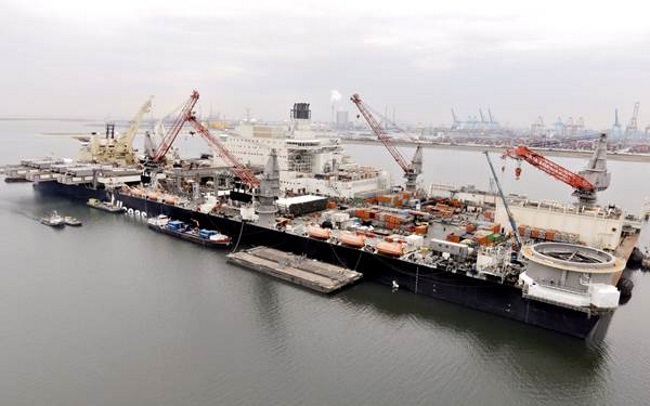 Simultaneously with various operations, like the removal of the pipe-laying stinger and placement of a heavy lifting crane, Fleet Cleaner has cleaned most of the fouled area of the hull. Cleaning the largest vessel in the world during one of most severe storms of the year shows that Fleet Cleaner is capable of cleaning any vessel, anytime of the year. Owned by AllSeas and with a length of 382 meter, the Pioneering Spirit is the largest vessel in the world. Despite the length, the Pioneering Spirit is also built like a catamaran which made it more challenging for Fleet Cleaner to clean the entire hull. Although the weather wasn’t very forgiving, the Pioneering Spirit still completed her operations and resumed her voyage after 6 days in port. Fleet Cleaner had the privilege to clean this great vessel during her port call. Furthermore, this storm increased the turbulence in the water which caused almost zero underwater visibility. However, due to the in-house developed navigation and tracking system, Fleet Cleaner was still able to complete a high-quality hull cleaning. Fleet Cleaner aims to deliver the most complete hull cleaning service without any downtime for ship-owners and is currently available in all Dutch ports.